The code below initializes the graph used in all the examples of this page. It should be run prior to any of the codes presented in this page. The packages networkx and matplotlib are recquired. We use a graph generated by the LCF generator of the networkx package. The graph and the edge capacities are deterministic, so that you can compare your results. # Use a fixed RNG seed so the result is reproducable. # Generate a graph using LCF notation. # Convert the capacities to a PICOS expression. 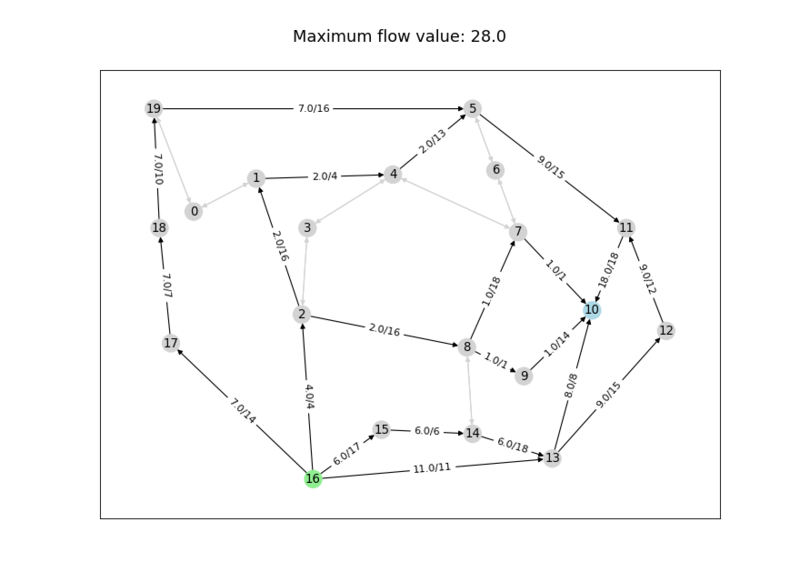 # Manually set a layout for which the graph is planar. # Set source and sink nodes for flow computation. node_colors[s]='lightgreen' # Source is green. node_colors[t]='lightblue'  # Sink is blue. # Define a plotting helper that closes the old and opens a new figure. # Plot the graph with the edge capacities. The first number on an edge label denotes the capacity from the node with the smaller number to the node with the larger number; the second number denotes the capacity for the other direction. Source and sink that we will use for flow computations are drawn in green and blue, respectively. the flow is conserved at each non-terminal node, . # Add the flow variables. # Add another variable for the total flow. # Set source flow at s.
# Set sink flow at t.
# Enforce all flow constraints at once. # Close the old figure and open a new one. # Determine which edges carry flow. # Draw the nodes and the edges that don't carry flow. # Draw the edges that carry flow. # Show flow values and capacities on these edges. # Show the maximum flow value. The graph shows the source in blue, the sink in green, and the value of the flow together with the capacity on each edge that carries flow. Given a directed graph , with a capacity on each edge , a source node and a sink node , the min-cut problem is to find a partition of the nodes in two sets , such that , , and the total capacity of the cut, is minimized. Remarkably, this LP is the dual of the max-flow LP, and the max-flow-min-cut theorem (also known as Ford-Fulkerson theorem ) states that the capacity of the minimum cut is equal to the value of the maximum flow. This means that the above LP always has an optimal solution in which is binary. In fact, the matrix defining this LP is totally unimodular, from which we know that every extreme point of the polyhedron defining the feasible region is integral, and hence the simplex algorithm will return a minimum cut. # Add cut indicator variables. # Add variables for the potentials. # State the potential inequalities. # Set the source potential to one. # Set the sink potential to zero. # Determine the cut edges and node sets. Due to a technical issue, the interactive Python listing below is not automatically verified. If you find an error, please refer to the section on reporting a bug. 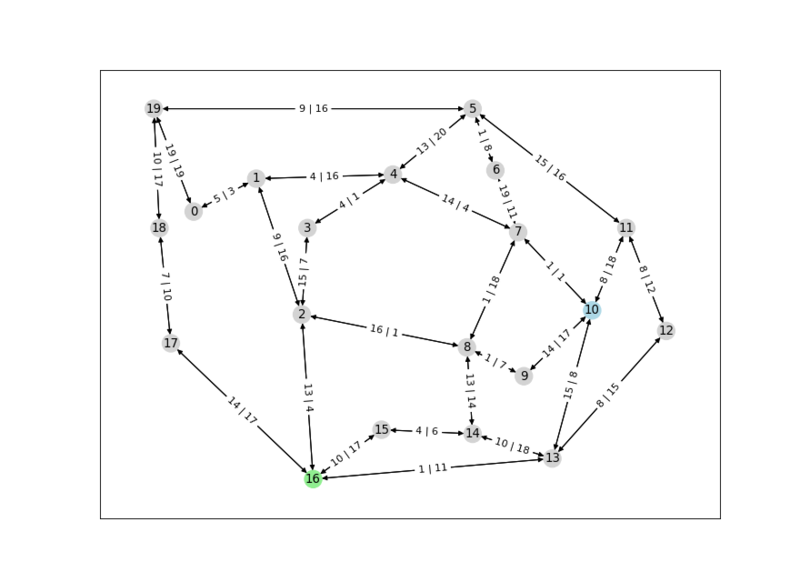 # Draw the nodes and the edges that are not in the cut. # Draw edges that are in the cut. # Show capacities for cut edges. # Show the minimum cut value and the partition. The graph shows the source in blue, the sink in green, and the edges defining the cut in red, with their capacities. 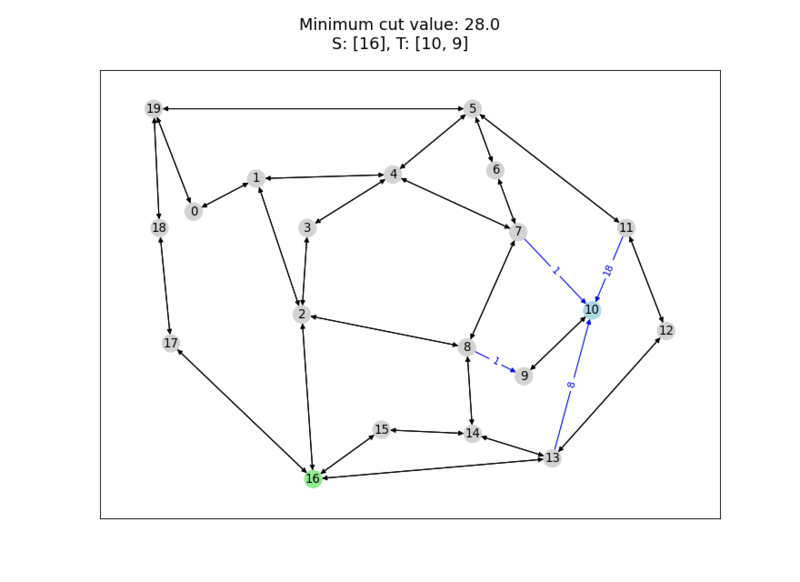 Multicut is a generalization of the min-cut problem, in which several pairs of nodes must be disconnected. The goal is to find a cut of minimal capacity, such that for all pairs , there is no path from to in the graph obtained by removing the cut edges. and to constrain the cut indicator variables to be binary. Unlike the min-cut problem, the LP obtained by relaxing the integer constraint is not guaranteed to have an integral solution (see e.g. ). We solve the multicut problem below, for the terminal pairs . # Define the pairs to be separated. # Extract the sources and sinks. # Define the cut indicator variables. # Define one potential for each source. # Set the source potentials to one. # Set the sink potentials to zero. # Define matching colors for the pairs. # Draw the edges that are in the cut. # Show the cut capacity. The graph shows terminal nodes with matching hue. Sources are a tad lighter than sinks to make them distinguishable. The edges defining the cut are drawn in red and show their capacities. The colors for the source nodes are, in order: Turquoise, red, orange, topaz, mustard and khaki. 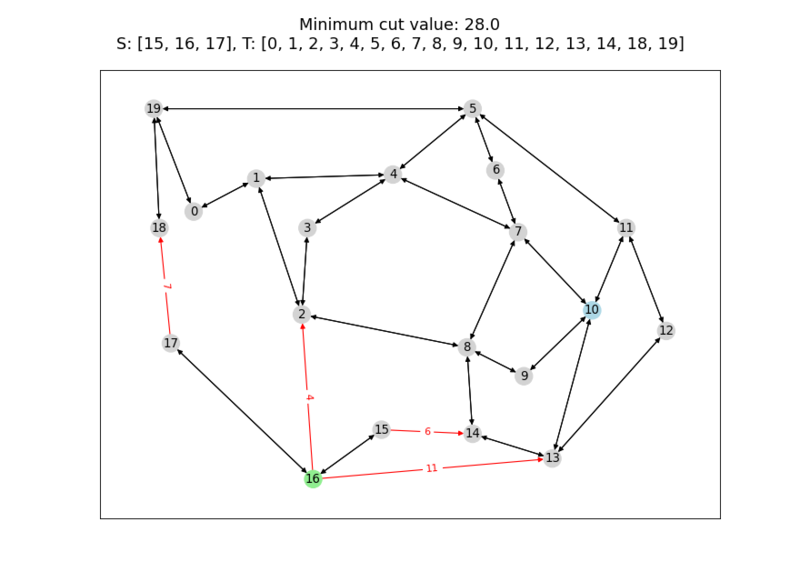 The goal of the maxcut problem is to find a partition (S,T) of the nodes of an undirected graph , such that the capacity of the cut, , is maximized. # Allocate weights to the edges. # Add the symmetric matrix variable. # Retrieve the Laplacian of the graph. # Constrain X to have ones on the diagonal. # Constrain X to be positive semidefinite. # Perform a Cholesky factorization. # Extract the cut and the seperated node sets. # Assign colors based on set membership. # Show the relaxation optimum value and the cut capacity. The graph shows the edges defining the cut in red. The nodes are colored blue or green depending on the partition that they belong to. “Maximal Flow through a Network”, LR Ford Jr and DR Fulkerson, Canadian journal of mathematics, 1956. “Analysis of LP relaxations for multiway and multicut problems”, D.Bertsimas, C.P. Teo and R. Vohra, Networks, 34(2), p. 102-114, 1999. “Improved approximation algorithms for maximum cut and satisfiability problems using semidefinite programming”, M.X. Goemans and D.P. Williamson, Journal of the ACM, 42(6), p. 1115-1145, 1995.